Preheat the oven to 375. In a small bowl, combine honey and sriracha. Taste and adjust for spice level. Add lime juice and stir to combine. When the sauce has the perfect balance of spice, sweetness, and tartness, transfer it to a larger bowl and add sprouts. Toss to combine. Transfer sprouts to a rimmed baking sheet in a single layer, and drizzle remaining sauce overtop. Sprinkle with salt (a couple big pinches will be plenty), and drizzle the oil overtop. 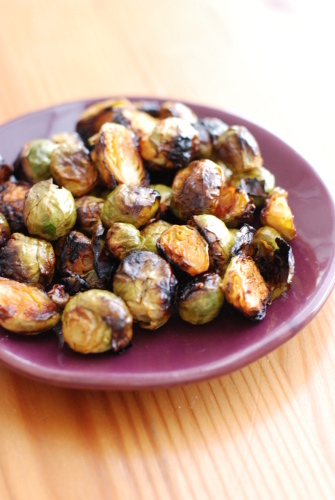 Bake for 25-30 minutes, depending on your oven, until sprouts are fully crisped outside, and soft but not mushy within. Serve immediately. This post is part of the Hearth and Soul Blog Hop for 5/3/2011. Check it out for lots of great recipes from real food bloggers. Blue Stockings is the last refuge for the intelligent, witty, often misunderstood, self empowered, sexually evolved women each one of us is...or at least is striving to be. Posted on May 2, 2011, in Hearth and Soul Blog Hop, Real Food Recipes. Bookmark the permalink. 3 Comments. indeed you are a bleustockings babe or perhaps purple! this sounds perfect! can’t wait to try it! and why haven’t i been invited to the red OR purple stockings? !